Since the cinema first began to be taken seriously as an art form, there has been a constant debate on the question: who is the real creator of the film, the writer or the director? 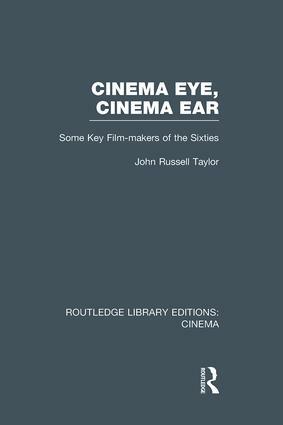 This study of a group of key film-makers in the sixties suggests that during this decade there was an emergence of a generation of film-makers who conceived a whole film in their minds just as an architect conceives a whole cathedral or a composer a whole symphony. The book presents detailed critical studies of the work of six commanding figures in the international cinema: four who have made their major reputations since 1950, the Italians Frederico Fellini and Michelangelo Antonioni, the Frenchman Robert Bresson and the Swede Ingmar Bergman; and two film-makers of an older generation, the Spaniard Luis Buñuel and the Anglo-American Alfred Hitchcock, who have reached the height of their powers and exerted their most important influence on the cinema during the same period. There is also a section on the new talents to emerge more recently in the French ‘New Wave’, in particular François Truffaut, Jen-Luc Godard and Alain Resnais. In addition, the book contains detailed filmographies of the directors discussed.